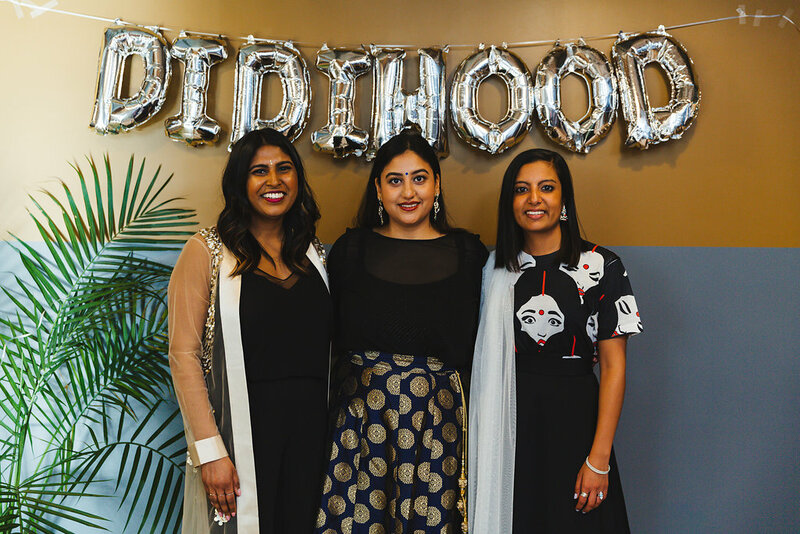 Arti Patel, Online Lifestyle Reporter at Global News, Nikkjit Gill, Managing Editor at Post City and Roohi Sahajpal, Case Manager at Vancouver Eastside Educational Enrichment Society, are the co-founders of Didihood. After #DidiTalks was trending on Twitter in June during an event hosted by Didihood, A Quarter Young connected with the co-founders to learn more about the impact of the collective, the significance of their events and the prospective plans in store. Read our full interview below for more. Didihood at Twitter Canada. Photo by: Sonia Saund. When did Didihood officially launch? We’ve had the idea for Didihood for about five or six years, but didn’t announce our idea publicly until September 2017. After an overwhelmingly positive response about what we wanted to do and a growing social media community, we had our official launch in April 2018. How did the idea for Didihood spark? We were all attending Ryerson University’s School of Journalism and were frustrated by the lack of stories [and] issues that we didn’t see being discussed in the media. We originally wanted to do a podcast where we would talk about issues South Asian women were dealing with, like marriage pressure and being the only brown person in [a] newsroom. The idea evolved from a podcast to a collective called Didihood, where these conversations could take place [while] amongst peers of other South Asian women experiencing similar things. Since the launch, how has Didihood grown and changed? Since our launch, we’ve seen the Didihood community come to fruition in ways we didn’t even imagine. We see our fellow Didis connecting online and at events. We have received job postings from Didis asking us to share them with our community in hopes that one of their fellow Didis will get the position. We are still in beginning stages and we have much that we want to accomplish, but within these last few months, we’ve seen the community grow far beyond the three of us, and that’s incredibly important to us. What’s been the best part about collaborating on Didihood together? We balance each other out and make a great team. We’re so excited about what we’ve created! The feedback that we’ve received from the community motivates us to keep bringing forth ideas and creating for our fellow South Asian women. We all have different experiences in our lives and careers and we bring these together to collaborate and grow Didihood. What is the significance behind the collective’s name? How did you land on it? We don’t exactly remember how we came up with the name but it [arose] during a brainstorming session. The significance ultimately lies with “Didi,” a word meaning “Sister” in many South Asian languages. From there, “Didihood” was created to symbolize the “Sisterhood” we are trying to create. We’ve noticed that people have really connected with the name, which has been so great to see. How would you describe the current state of creative industries in Canada for South Asian women? We believe we are at a turning point. There are amazing and incredibly talented South Asian women across every creative industry and we simply want to see more. We also want to see these women in decision-making positions. And the best way to increase our representation is to continue to occupy those spaces and to help each other along the way. How do you hope Didihood works to improve these industries for South Asian communities across the country? With representation comes improvement. In order for our stories to be told in these industries, and in order to encourage the next generation to enter these industries, we need to be in these industries, too. In what ways does Didihood unite South Asian creatives across Canada? How does the collective support its members? Didihood provides a platform where Didis can meet, network and collaborate. Whether they are connecting at our events, through our social channels or learning about a new Didi in our monthly newsletter, we are creating a space where these connections can be made. So many Didis come to our events on their own and meet friends and peers while they are there. It is such a friendly atmosphere with so much positive energy. In the fall, we will also kick off the workshop aspect of our collective, where we hope to host workshops for university students looking to break into creative industries. And our 2019 goal is to get our mentorship program off the ground! How does Didihood ensure that everyone who identifies as a woman is able to become part of the collective? Diversity and inclusion are really important to us. We recognize that even within the South Asian community, the narratives can become dominated by certain groups, so we aim to create a space for all South Asian women. We want to include everyone who identifies as a South Asian woman, [making them] feel welcome and [ensuring they] have a space. We are also welcome to any suggestions, comments and ideas on how we can work to be more inclusive. Why is it so important for your members to feel a sense of community while connecting with like-minded sisters? At our launch party earlier this year, some of the women there commented on the fact that they had never been in a room with that many South Asian women outside of a wedding. We sensed when we did our launch, we had created something important. When you didn’t grow up seeing women who looked like you doing what you were dreaming of, it felt isolating. We hope that with Didihood, we can connect like-minded women to inspire and learn from each other. We hope that the younger generation of women can see these spaces and be encouraged to pursue their creative dreams. Building this community is just the first step and we hope that by making a space to let these conversations and connections happen, we can create change. The Didihood launch party in April 2018. Photo by: Sonia Saund. In late June 2018, you hosted #DidiTalks, the first annual event of its kind. What did guests who attended experience? For many of us, it was the first panel we had ever attended where all of the panellists were South Asian women. Our guests were able to relate to each of the panelists’ experiences and our [speakers] did an amazing job of being real and [sharing] very personal [stories]. There were laughs and there were tears. We all walked away with valuable information for how we can achieve our goals in our respective industries. What was one of the toughest challenges you faced with #DidiTalks? How did you get through it and what did you learn? One of our challenges was achieving representation across our panel. This is something we discuss when planning all of our events, as we want to be as inclusive as possible. We know that we will not always be able to represent each culture, language and religion that all of our Didis identify with, and we definitely fell short of that with this [first] panel. But, it remains something that we strive towards. We also read and discuss all of the feedback we receive from our community about this. What did it feel like to plan and produce #DidiTalks? How did the energy in the room during the event compare to your lead-up experiences? The energy in the room at our events has become our favourite aspect of the entire process. Planning is always challenging, but through our partnership with Twitter Canada and Twitter Asians, we were able to execute #DidiTalks with ease. Once the room fills with Didis, all of the time and effort that goes into the planning process is completely worth it. There’s nothing better than watching these Didis connect with each other. What do you hope the second annual #DidiTalks will entail? Just like our first event, we really want to give women a platform to express themselves and educate others around them. We want to offer a space that features a variety of voices, from the ones you hear often to the ones you don’t. Looking at feedback from the first event, it is clear more open dialogues like this are needed. When we plan [a talk] for 2019, we hope to broaden our scope on topics to cover. What type of feedback have you received regarding Didihood’s vision? Our growth has been quite organic and it has been wonderful to see so many women across the country (and beyond) connect with us. For many, including all three co-founders, this is the first time a space like this has existed and has allowed us to be ourselves. Secondly, for many South Asian women, there is a social component that is missing [outside of Didihood]. Often, the South Asian people close in our lives are family members or friends from the community. [Our collective] has allowed women to meet women from all walks of life with very similar careers. It has also been a place for growth. Didihood has allowed sisters from all fields to network, mentor and connect with each other to create and produce content. Our goal is to make sure we have each other’s backs. What goals do you hope to achieve within the next three to six months that will continue to improve the creative industries for South Asian women in Canada? Our next big goal is to launch a base group of women in Vancouver. This way, we can tackle two cities at a time, ensuring we are doing the best [we can] to get women together [in support of] our three pillars: mentorship, networking and social events. Our next goal in Toronto is to set up our first workshop for students [as mentioned] and soon after, moving into a more concrete mentorship program that allows young South Asian women to connect with others already working in these fields. In Ontario, Doug Ford is the new Premier and with his majority government comes a lot of controversy. How do you think his run as Premier of Ontario will impact Didihood? How will the collective work to ensure the voices of South Asian creatives are heard, despite the politics at play? We will do the same work we have always been doing – politics hasn’t played a major role in this. If discussions in our community need to happen and need support, we will stand in solidarity with groups who are already doing the groundwork. Didihood is on Facebook, Instagram and Twitter. Which social media channel do you find brings you the most engagement and online impact? Why do you think this is the case? Right now, we are thriving on Instagram and Twitter. In fact, our collective started on Twitter in 2017. These spaces have allowed us to build an online community where women feel comfortable interacting with each other. We’re not sure why these two [platforms] seem to have the most engagement, but it could do a lot with age and the type of content we are sharing. What’s next for Didihood? When will you host your next event? We are hosting our first event in Vancouver at the end of August, which will be an official west coast launch and meet-up for women in creative fields in [that city]. We are super excited to see what the challenges, goals and insights are for women who work in these industries out west. Do you have any words of wisdom for other South Asian women currently exploring the creative industries? If yes, please share. Stick to it, no matter what others have to say about it! One of the biggest takeaways we’ve learned not only as co-founders, but as women who have worked in the field is: you may hear negative opinions from others who may discourage you from entering these industries. We want South Asian women to know their voices are valid, their talent is notable and their creative side is needed in industries that have very few women of colour. To learn more about Didihood, follow them on Facebook, Instagram and Twitter. You can also subscribe to their monthly newsletter on TinyLetter. The feature photo is by Sonia Saund.